Driverless vehicles are about to take to UK roads, thanks to work led by the International Vehicle Standards Team at the Department for Transport. The team’s recent regulatory review suggests that automated cars could make our roads safer, quieter and cleaner. Lydia Fitzpatrick, strategic communication manager, explains what the government is doing to make this happen. A revolution is about to take place on our roads. A review just published by the International Vehicle Standards Team at the Department for Transport (DfT) is paving the way for the testing of driverless vehicles on UK roads, taking us a step nearer to fully automated cars. Many of us already enjoy driver assist technologies that have been steadily introduced as standard by vehicle manufacturers. Things like cruise control and anti-lock braking make driving easier and safer – but the driver still needs to concentrate on driving 100% of the time. But imagine surfing the web, reading a book or turning to chat to your passengers face to face as you travel to work or take one of your many routine journeys. The average driver spends 235 hours behind the wheel every year – that’s the equivalent of six working weeks. Automated cars mean that, for the first time since the invention of the motor vehicle, the ‘driver’ will be able to choose whether to control their car or hand over to the vehicle itself. Imagine life with fewer traffic jams and collisions. As well as making driving easier and freeing up time to do other things, the other important benefit is improving road safety. Human error is a factor in more than 90% of crashes – whilst, on the other hand, UK research found that vehicles fitted with just one advanced safety technology, Electronic Stability Control, are 25% less likely to be involved in a fatal collision. Highly and fully automated vehicles are a natural progression from today’s automated safety technologies, such as advanced emergency braking, traffic jam assist and lane keeping assist. These are already fitted to many high-end cars and are gradually filtering down to more mainstream vehicles. Automated driving avoids the problems of drivers being distracted, misjudging other road users’ movements, failing to look, or being careless or in too much of a hurry. A range of sensors to monitor surroundings mean that automated cars will not make these mistakes. Required to respect all road traffic laws and the Highway Code, they will not break the speed limit, not tail-gate or run red traffic lights. This is expected to substantially reduce collisions, deaths and injuries on roads. It could also help reduce our driving costs. The insurance industry is already working to encourage the fitting of advanced emergency braking systems to all new vehicles – and a reduction in insurance claims could lead to lower premiums. More consistent driving will reduce emissions and ease congestion. Driverless vehicles are expected to be able to communicate with each other and their surroundings to identify the optimum route, helping to spread demand for scarce road space, reduce congestion and give more consistent journey times. Vehicles can also communicate with traffic lights and other roadside infrastructure and use this information to minimise fuel consumption and emissions. Most of us take driving for granted and cannot imagine life without our car. However there are many people who do not have a driving licence and even more who do not have access to a vehicle. Disabled people may be unable to drive. Elderly people may be judged unfit to drive. Others may simply not want to drive or be concerned about their ability to do so. Fully automated vehicles, which don’t require a driver at all, could dramatically improve the mobility and quality of life of people unable or unwilling to take the wheel. The UK is already a world leading centre for vehicle research and technology. We have some of the best innovators, engineers, facilities and opportunities for automotive investment in the world. Recognising the benefits of driverless or autonomous cars, government is keen to support their development in the country. Chancellor George Osborne paved the way in his 2013 Autumn Statement, when he announced the regulatory review in the National Infrastructure Plan to enable the trialling of driverless cars on UK roads. He also announced the prize fund for cities or towns to test the technology. As manufacturers have been carrying out extensive testing on private test tracks, the next logical step is carefully controlled testing on public roads. The Department for Transport’s regulatory review was published on February 11 giving the legal clarity to support these trials of automated vehicles on UK roads. The review allows for real-world testing of automated technologies, providing a test driver is present and takes responsibility for the safe operation of the vehicle and that the vehicle complies with road traffic law. It is a significant milestone as it marks the government's initial stage in developing a strategy to ensure we capture these potential benefits while maintaining our excellent road safety record. While the review confirms the way ahead is clear for testing of these vehicles, there are still challenges for vehicle developers to overcome before driverless cars are an everyday sight on our roads. For example, the sensor systems need to be developed to improve performance in rain and snow, ensuring that objects can reliably be distinguished from weather conditions. The review also sets out the actions the government will need to take before these vehicles can come to market. This includes providing clarity on how liability passes between the driver and the vehicle manufacturer according to mode of operation, and working with the insurance industry to develop requirements governing insurance of highly and fully automated vehicles. Liability and insurance issues are closely connected and the government will work closely with stakeholders to ensure the complexity of these areas is carefully considered. Information and learning from real-world testing will help inform this work. The Department for Transport is working jointly with the Department for Business, Innovation and Skills on the £19 million competition funding for trials now underway in Greenwich, Bristol, Coventry and Milton Keynes. 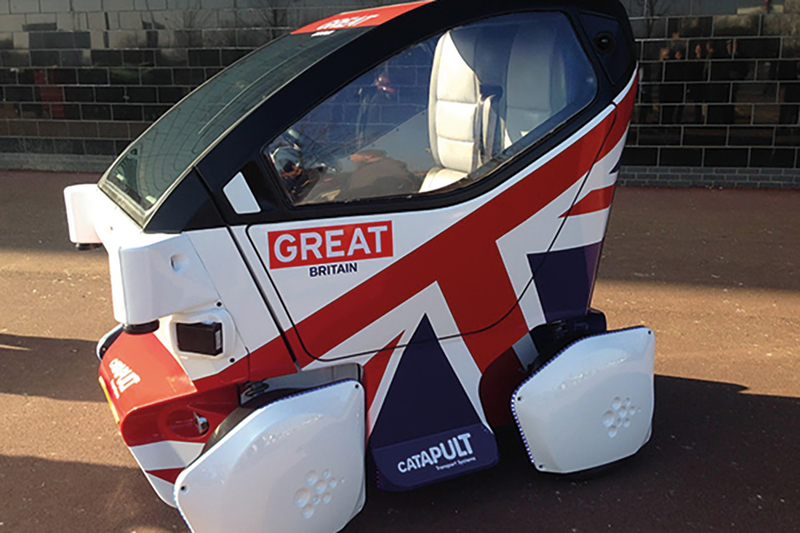 Innovate UK is overseeing consortia made up of representatives from cities, business and research organisations testing automated vehicle technology. In Coventry, futuristic self- driving pods will ferry people from the railway station to the town centre, while Bristol will be testing technologies such as car-to-car communication and advanced sensor systems for buses. Greenwich will see an innovative driverless shuttle vehicle used to transport people to the O2 arena as well as autonomous valet parking. All three consortia are also proposing to include road trials of highly automated cars. This is possible because testing conditions in the UK offer the best possible framework to encourage the largest global businesses to come to the UK to develop and test their technologies. Unlike other countries, we do not limit trialling to the test track or certain geographical areas. We don’t require certificates or permits, or the need for a surety bond (provided insurance has been arranged). Instead, a Code of Practice, currently being developed with the input of stakeholders and due to be published in the spring, will include specific requirements to promote safety and maintain our excellent road safety record. Working with the devolved administrations, DfT will review and amend domestic regulations to accommodate driverless vehicle technology by summer 2017. In parallel the government will liaise at an international level with an aim to amend international regulations on the use of driverless car technologies by the end of 2018. Supported by the investment from Government and others, we can create the perfect environment in the UK for building the automotive technologies of the future. We believe the UK is uniquely positioned to become a premium location globally for the development of these technologies. Already multi-national companies such as Ford, Shell and Jaguar Land Rover are working alongside UK based experts and innovators in this field such as Oxbotica, Gobotix and Williams Advanced Engineering as part of the three consortia receiving the Government’s grant funded driverless car trials. Government expects driverless vehicles to provide significant economic, environmental and social benefits. It creates a tremendous opportunity for the whole country to share in shaping the future of these exciting developments and the government, working with the devolved administrations, wants to play its part in making that happen. What cars will we be driving tomorrow?